Whether you live in a cozy apartment or rambling suburban home, a cottage by the sea, or a lodge in the mountains, your living room creates a lasting impression for all who enter. It tells your family and guests if you’re formal and elegant or fun-loving and laid-back. It sets the mood for the home and should be a reflection of the owner’s personal taste. For some, this space is formal and perfect at all times, to be entered and used only when guests come to call. To others, it serves as a comfortable family gathering place for watching TV, doing homework, or visiting. Some have a cozy nook for sipping tea and curling up with a book. A formal living room, historically referred to as a drawing room or parlor, often showcases the homeowner’s finest possessions. 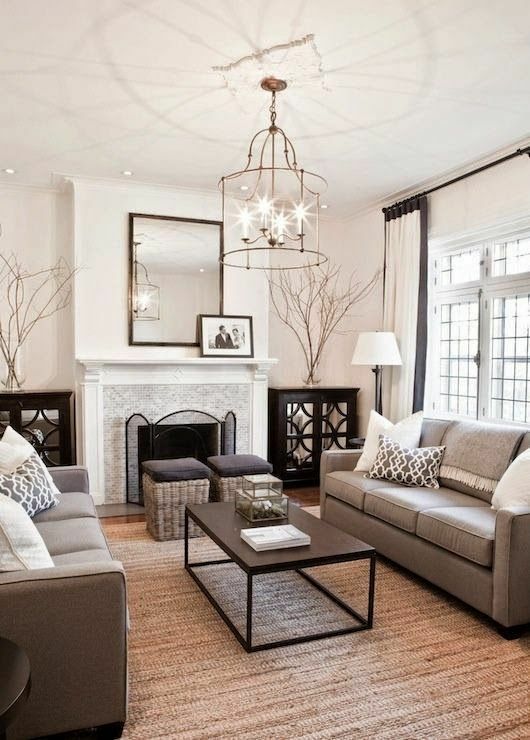 The décor is often symmetrical—a sofa with painting above, flanked by two end tables topped by lamps. Formal window treatments of luxurious fabrics trimmed with braid and fringe, and perfectly set pairs of occasional chairs and tables follow traditional rules of decorating. Few homes these days have space for such a perfect (and often useless) room that is more to be looked at than used. Decorating style has evolved to allow a less formal look. While retaining certain elements such as beautiful millwork or lush fabrics, the more casual living room has lighter window treatments and more comfortable furniture. Studied symmetry has given way to softer lines, fewer rules, and more color. A more casual family room style of living room has a character of nonchalance. While furniture and fabrics should be coordinated, there are few rules. Choices are governed by practicality. Furniture selection and placement is less structured. Seating around a TV is often necessary, with a table for casual eating. In today’s home, the living room may even have a computer center, so a desk may have a place of prominence. Regardless of what purpose your living room serves, the fabrics, colors, furniture, and accessories should be what you love. Whether it’s serene and neutral, colorful and lively, or something in-between, it should reflect your taste. After all, this is your room for living.